Do alien planets around other stars have the right ingredients for a pre-biotic soup? This artist’s conception shows a young, hypothetical planet around a cool star. A soupy mix of potentially life-forming chemicals can be seen pooling around the base of the jagged rocks. Observations from NASA’s Spitzer Space Telescope hint that planets around cool stars – the so-called M-dwarfs and brown dwarfs that are widespread throughout our galaxy – might possess a different mix of life-forming, or prebiotic, chemicals than our young Earth. Life on our planet is thought to have arisen out of a pond-scum-like mix of chemicals. Some of these chemicals are thought to have come from a planet-forming disk of gas and dust that swirled around our young sun. Meteorites carrying the chemicals might have crash-landed on Earth. Alien life on distant worlds. What would it be like? For millennia people could only wonder, but now NASA’s Spitzer Space Telescope is producing some hard data. It turns out that life around certain kinds of stars would likely be very different from life as we know it. Using Spitzer, astronomers have discovered the organic chemical acetylene in the planet-forming discs surrounding 17 M-dwarf stars. It’s the first time any chemical has been detected around one of these small, cool stars. However, scientists are more intrigued by what was not there: a chemical called hydrogen cyanide (HCN), an important building block for life as we know it. 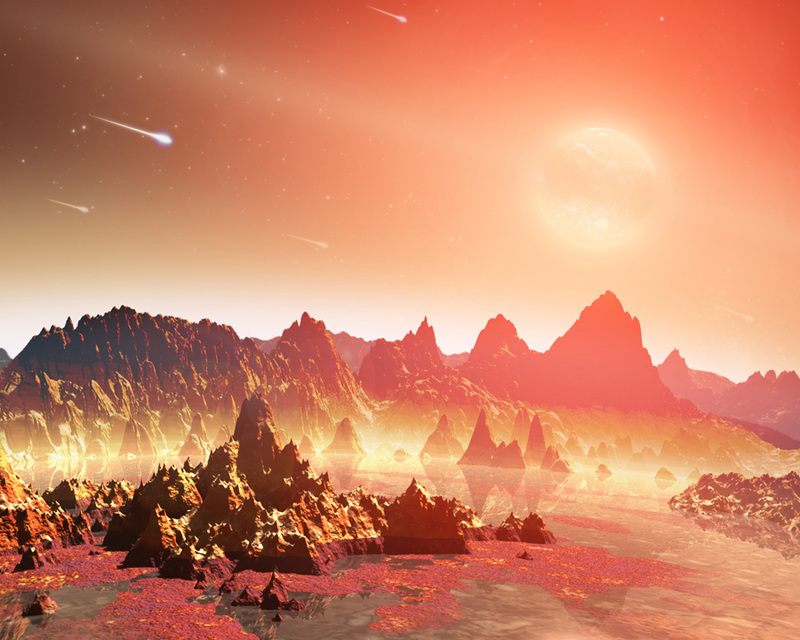 “The fact that we do not detect hydrogen cyanide around cool stars suggests that prebiotic chemistry may unfold differently on planets orbiting cool stars,” says Ilaria Pascucci, lead scientist for the Spitzer observations and an astrophysicist at Johns Hopkins University in Baltimore, Maryland. M-dwarf and brown dwarf stars emit far less ultraviolet light than larger, hotter stars such as our sun. Pascucci thinks this difference could explain the lack of HCN around dwarf stars. For HCN to form, molecules of nitrogen must first be split into individual nitrogen atoms. But the triple bond holding molecular nitrogen together is very strong. High-energy ultraviolet photons can break this bond, but the lower-energy photons from M-dwarf stars cannot. “Other nitrogen-bearing molecules are going to be affected by this same chemistry,” Pascucci says, possibly including the precursors to amino acids and thus proteins. To search for HCN, Pascucci’s team looked at data from Spitzer, which observes the universe at infrared wavelengths. Planet-forming discs around M-dwarf stars have very faint infrared emissions, but Spitzer is sensitive enough to detect them. HCN’s distinctive 14-micron emission band was absent in the infrared spectra of the M-dwarf stars, but Spitzer did detect HCN in the spectra of 44 hotter, sun-like stars. Infrared astronomy will be a powerful tool for studying other prebiotic chemicals in planet-forming discs, says Pascucci, and the Spitzer Space Telescope is at the forefront of the field. Spitzer can’t yet draw us a picture of alien life forms, but it’s beginning to tell us what they could–and could not–be made of. “That’s pretty wonderful, too,” says Pascucci. For news of other discoveries based on Spitzer data, visit http://www.spitzer.caltech.edu. Kids can learn Spitzer astronomy words and concepts by playing the Spitzer “Sign Here!” game at http://spaceplace.nasa.gov/en/kids/spitzer/signs.